This month, in honour of Christmas we’re going to kick things off off with the home of one of the oldest, biggest and bestest Christmas markets in Europe – the German town of Stuttgart. Nearly four million people visit Stuttgart’s Weihnachtsmarkt (Christmas market) making it the biggest in Europe. The festival has been held in Stuttgart for the past 300 years, which makes it one of the oldest too. More or less the whole city is transformed by the Christmas market. “Schlossplatz” (Palace Square) turns into a fairy tale winter wonderland, there’s open-air ice skating by the New Palace, as well as carousels, a huge Ferris wheel and a miniature steam railway. Over 200 stalls fit into surrounding streets and the market square – you can shop amid the twinking lights for Christmas tree decorations, candles and hand crafted toys. 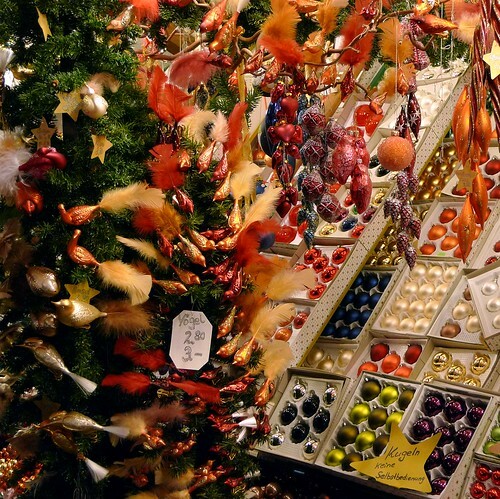 As you would expect you’ll find plenty of traditional Christmas fare: the scent of mulled wine, baked apples and hot chestnuts is everywhere. If all this isn’t enough, elsewhere in the city you’ll find a Christmas antiques market in downtown Stuttgart and there are choirs and festive music performances every night on the Town Hall steps and in the Old Palace’s Renaissance-style inner courtyard. Stuttgart’s Christmas Market is hardly the only festival in the city. Stuttgart also holds an annual ‘Volksfest’ or autumnal fair in September which rivals Oktoberfest in terms of size and revellry. There’s also a spring festival held annually on the same grounds. Both festivals have huge funfairs, but we’d only recommend bringing children during the day or on the special family days. There’s a 10-day long wine festival held in September and lots of smaller festivals including a July Jazz festival and a Festival of Animated Film in the spring. 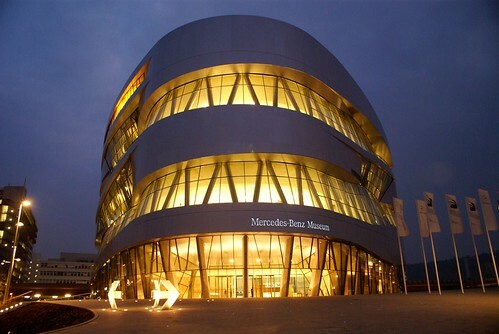 Stuttgart has been at the heart of Germany’s motor industry and so unsurprisingly the city’s top attraction is the Mercedes-Benz Museum. The modern building alone is worth a look, but inside you’ll find an extensive history of automobiles and over 130 cars on display. Motor fanatics should allow a lot of time for this one! The smaller Porshe Museum is also worth a look. Wilhelma zoological and botanical gardens is another popular Stuttgart attraction, especially with families. The zoo enclosures are pretty open, and there are lots of more interactive parts like a petting zoo and playgrounds. The gardens are open all year round, but better in summer when you can picnic surrounded by the wandering flamingos and peacocks. Stuttgart is surrounded by vineyards, so a popular day trip is to visit (and sample the produce at) the local wineries. You’re also close to the Black Forest, for some hiking and stunning scenery. Stuttgart is rather easy to reach from the UK. Average flight time is under two hours. germanwings, British Airways, Lufthansa and bmi all fly from London. You can also fly direct from Manchester with Lufthansa or bmi, and British Airways and Flybe operate direct flights from Birmingham. You can also fly into Frankfurt and catch the train into central Stuttgart. dealchecker’s flight comparison tool will help make sure you’re getting a great deal on your flights to Stuttgart.